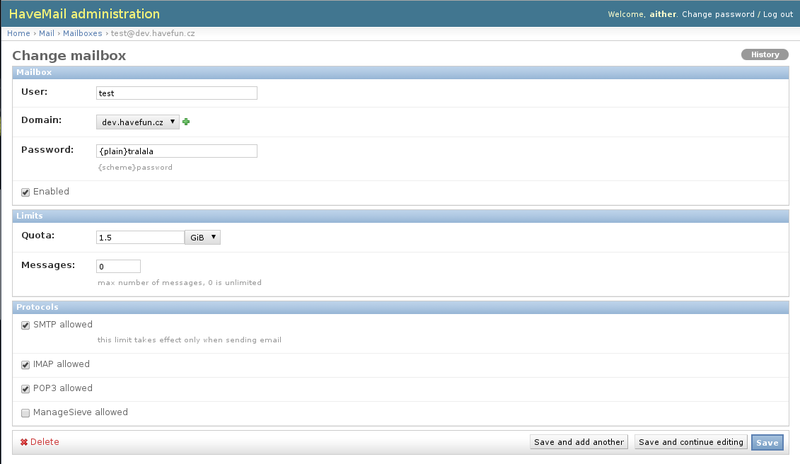 HaveMail is a web administration for virtual mailboxes in Postfix and Dovecot. This configuration should work in RHEL6. These examples show only how to connect Postfix and Dovecot with HaveMail, this is not a complete mail server setup. Edit settings.py – configure database, TEMPLATE_DIRS, MAIL_PROTOCOLS and JABBER_DOMAINS. Databases for ejabberd needs to be created manually. HaveMail is released under GNU/GPL. Written in Python with Django framework, MySQL.